The Large Sports Combo is great for outdoor events that welcome large crowds and also fits well into indoor play centers that offer themed attractions. Rental operators may enjoy success with this product with relative ease, as it only requires a one-man transport and setup. The Large Sports Combo is a crowd pleaser wherever it is featured, be sure to enjoy its popularity. 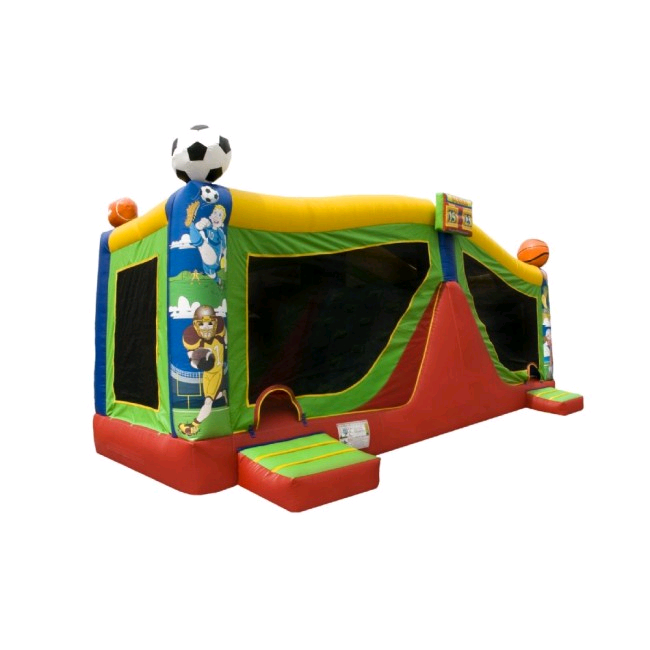 The Large Sports Combo has a 10’x10′ bouncer with a basketball hoop and an 8.5-foot tall climb and slide. It features a separate entrance and exit room for ease of cycling through riders. For a large product, it is relatively light in weight and is easy to set up. Magic Jump’s sports arena design is popular with sports enthusiasts and is an excellent choice for all sporting events.